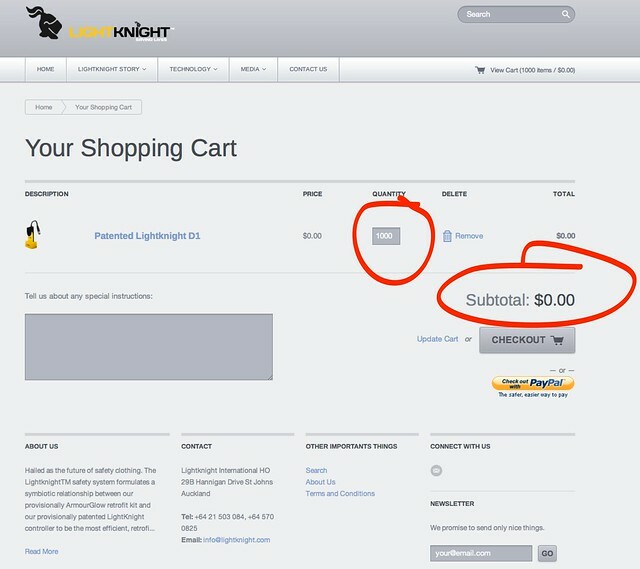 Lightknight is receiving customer interest, reports Christopher Adams from the NZHerald (no paywall yet). So I thought I’d check them out. I had no idea I could also give them a big order. 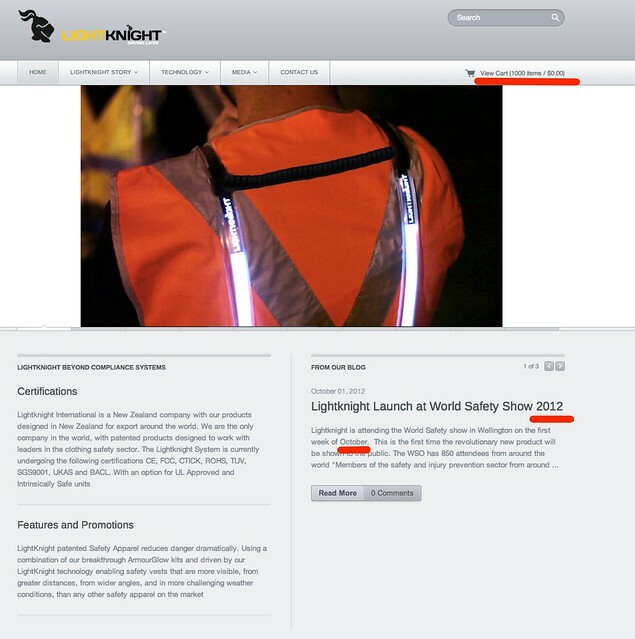 It seems like a good product – lights that go on HiViz vests to increase visibility at night, and arising from a stated industry need. They got some funding back in 2011 from NZ VIF and IceAngels and was launched late last year. So – the product seems good, but where it falls down hard is the website. Firstly though, before we look at it, let’s think about what the biggest benefit is that the product brings, and who the target market is? I see that the benefit is that workers can be seen at a distance at night when they are not illuminated from an external source, and that the market is GMs and safety officers for companies and contractors in fields like roading, industrial plants, construction and so forth. So – what would we expect to see on the home page? Yes I can see the product, and that’s a great way of communicating the primary use. But I don’t get to see anything on the safety benefits, beyond a statement in the fineprint that it “reduces danger dramatically”. Increase the visibility of your staff by up to X times, backed up by a distance visibility test of a vested and lit-vested staff member in a dark place. Easy to operate and maintain – admittedly one of my first questions. Back this up by showing how long the battery lasts, how light it is and how robust it is in practice. 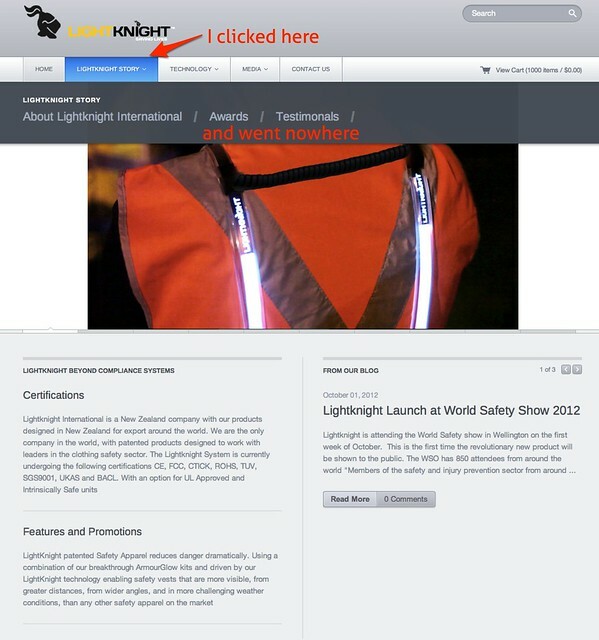 and I’d also talk about the other operator benefits such as safer walking, better work area lighting and so forth. Or not. Clicking on the Lightknight story brings up a useless submenu. Expected behaviour when I click on a menu is that I go somewhere, and this fooled me (really). Every time a website does something unexpected then the chances of me leaving increase. But I stayed – and there was a reason. Lose the sub menu and put all that content on the LightKnight story page. 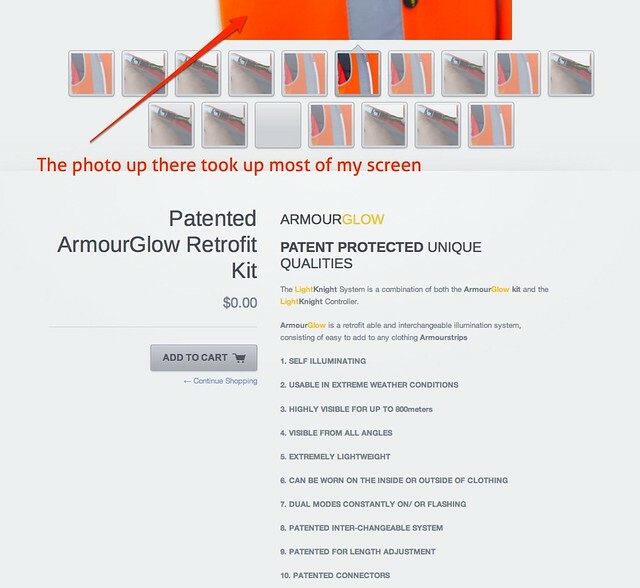 The most compelling part of the LightKnight story is the product, but on this page we see nothing. Nor do we read about the reason LightKnight exists – the customer cause or the reason for being. The greatest silliness is in the LightKnight word itself, two tone and with a TM symbol. Ludicrously unreadable. Write the story of the company, how it started, what the customers wanted and how you developed and tested it. Show pictures of the founders at work and of the prototypes and current products in the field. Show the product benefits as well. On to the Technology section, where we have the reverse problem. There appears to be no text at all on this page, just a rotating series of images. I picked the worst image – which is mostly out of focus. I learned nothing at all about the technology from this page and moved on. Later, when I tried to find a product to buy, I realised that there is in fat text on this page, it’s just that the photos are so large that the text is hidden. Rename the tab from “Technology” to “Products”. Create a new tab called “Technology” and tell the story of the technology on a nice long page. Check out any Apple product page for how to do this. The ALL-CAPS bullets without any illuminating text under each is not compelling to buyers. 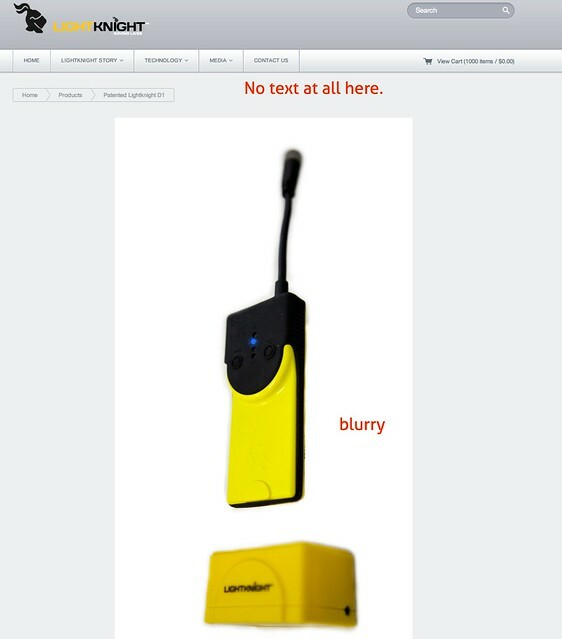 This is a sales page, but aside from the Add to Cart button there is little on it that feels professional. Suggested Changes: Again, check out any Apple product page, but in general make this page a story again, prioritise and walk through the benefits, and provide the fine print for those who want to delve. I decided to buy 1000 units – as the price was right. You can too, for now. Suggested Changes: Put your prices up. Fast. This is the sort of screen we’d expect to see on a just-launched site. It has no place on a professional website. I’m not going to say anything more. Overall the site feels like something that was thrown up in a hurry 2 years back, rather than the focal point for a B2B sales driven company. It’s unprofessional. Suggested Change: Get professional help. A full service design and development firm that will help with your messaging and branding. There are several of these in New Zealand, but go for a good one locally where you can meet face to face and work together. You’ll need to be paying at least $120 an hour, if not far higher. A great firm will also help you with your sales materials that you use when you visit clients or respond to them on email. Investing in this sort of thing reaps huge dividends. If this feels too expensive, then you need to add a founder to the team, someone who can do all this easily and is willing to do so for equity. But it is certainly not acceptable to leave this alone. 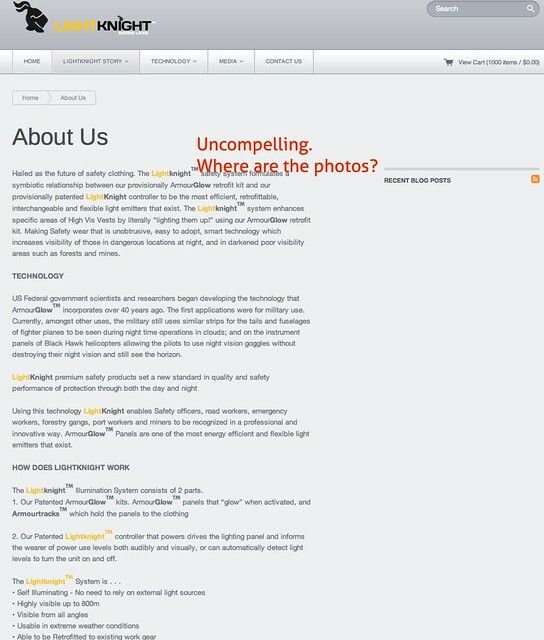 At the very least start improving the website text. Lucky for us we are half way through development of a new site. But thanks for your what we see as constructive criticism its great way for us to learn about how to improve it, and implement some of your ideas. Your quite right we have spent the last few months focusing on creating an brilliant unique patentable product, and now is the time to be matching the creativity of the product with an equally creative site. Hmm. If you’re only half way through, why is it live? That’s a bit like promoting a stage show where punters actually see the first week of rehearsals. 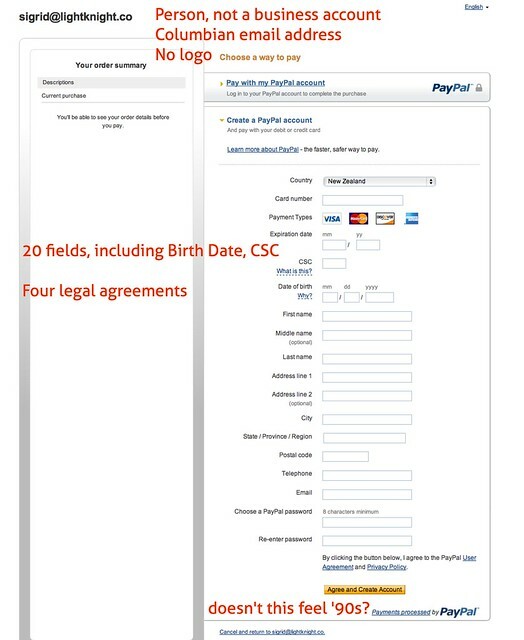 Unpublish the bits that aren’t finished, engage a professional copywriter and consider DPS over Paypal, which is a far better checkout experience. 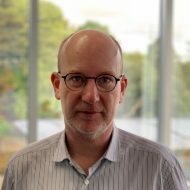 Thanks Phil sorry if i wasnt clear, this site is the old one we have not uploaded the new One and therefore it is not live yet, it has been written by a professional and we will update this blog when it is. Should be by the end if the week. We have been advised to stay with PayPal due to client base coming from such a variety of countries but will look into dps also. Thank you for your comments it’s great to get feedback. We really appreciate it.